Pregnancy can be a wonderful time in a woman’s life, but it doesn’t occur without some unpleasant side effects. Persistent pain, migraine headaches, nausea associated with “morning sickness,” and inflammation and swelling of the ankles are only a few of the common conditions that occur at this time. Pregnancy can be taxing on a woman’s body, and just when she could use some of the relief that cannabis provides, most women wisely choose to abstain from consuming marijuana. But what about cannabidiol (CBD)? It has no psychoactive effects like marijuana but is known to relieve a host of uncomfortable conditions, including the ones mentioned above. CBD has the potential to provide significant relief, but the question of whether or not it’s safe for a developing fetus should be a concern of every cannabis-loving woman during pregnancy. Prior to embarking on a CBD regimen, a prudent first move should be a discussion with a prenatal care physician—hopefully one with an open mind and knowledge about the potential benefits of cannabinoids. The World Health Organization (WHO) evaluation of CBD led to some interesting determinations about its safety and abuse potential. Not only is there no indication of a public health risk associated with CBD, but there’s also no indication that it has the potential for abuse. Not only that, but WHO also concluded that CBD shows promising benefits for treating a range of health problems. Most people would agree that abstaining from marijuana use during pregnancy is the best course of action. Not that tetrahydrocannabinol (THC), doesn’t have great potential for numerous medical conditions, but it also has psychoactive properties. Like alcohol, women would be wise to abstain from using marijuana or related THC products while pregnant, or at least until additional research indicates it would be safe for the developing fetus to do so. The endocannabinoid system has various receptors in the human body that are influenced by the consumption of various cannabis compounds, including cannabinoids and terpenes. Development of the endocannabinoid system occurs at a very early stage of fetal development. Because of this, the cannabinoids and other compounds consumed by the mother of a developing fetus impacts the fetus growing inside the mother. Because the mother and developing child share the same body, the best course of action for pregnant women is to consume only nutritious foods and substances throughout pregnancy and later if breastfeeding. There are only limited studies that have been done on the effects of CBD on developing fetuses, but one study concluded that CBD consumption may reduce uterine contractions. This study, of course, does not make any conclusions about the effect of CBD on developing fetuses. It seems clear there is little doubt that consuming CBD can provide beneficial relief for a range of the negative effects relating to pregnancy. Let’s identify some of the common signs of pregnancy, as well as how CBD may benefit expectant mothers. One of the negative effects of being pregnant is nausea and vomiting. This is particularly true during the first trimester of pregnancy. Often referred to as “morning sickness,” pregnant women are afflicted with this condition upon waking. The reasons for morning sickness are not fully understood, regardless of the fact that it is a well-known symptom of pregnancy. Just like cannabinoids can aid people with nausea that accompanies chemotherapy, there is good reason to believe it can do so for pregnant women as well. Although there is plenty of anecdotal evidence to support this belief, there also is scientific evidence that cannabinoids can relieve nausea. Another negative effect of pregnancy is mood fluctuations and the emotional state of pregnant women during this time. For some women, the emotional rollercoaster of pregnancy is more pronounced than others, and the common belief is that it’s related to hormone fluctuations. For some women, anxiety can become so common and acute that full-blown panic attacks occur. Clearly, this is more than merely unpleasant, it’s debilitating. Research about CBD treatments for anxiety includes one notable study about people who have pronounced fear associated with public speaking. CBD provided relief for these individuals. Other studies and related articles also suggest that CBD can, indeed, soothe anxiety. Additional research will no doubt shed light on CBD’s benefits for people with anxiety. Inflammation of the legs and swollen ankles are a common occurrence during pregnancy, particularly during the last trimester when developing fetuses are approaching full term and women have gained significant weight. Doctors often advise women to stay off their feet as much as possible at this stage. Cannabinoids, including CBD, have been shown to reduce inflammation. A rising number of people—including athletes—are opting for CBD rather than other substances to treat and reduce inflammation. Another undeniable affliction associated with pregnancy is pain and discomfort. The female body goes through a lot during the more than nine months that pregnancy lasts. The fact that most women are able to rebound from their pregnancy so quickly is really quite remarkable. Fortunately, CBD has been shown to be effective for pain relief relating to a wide range of causes. There are mountains of anecdotal evidence as well as clinical research that supports the practice of consuming CBD for effective pain relief. 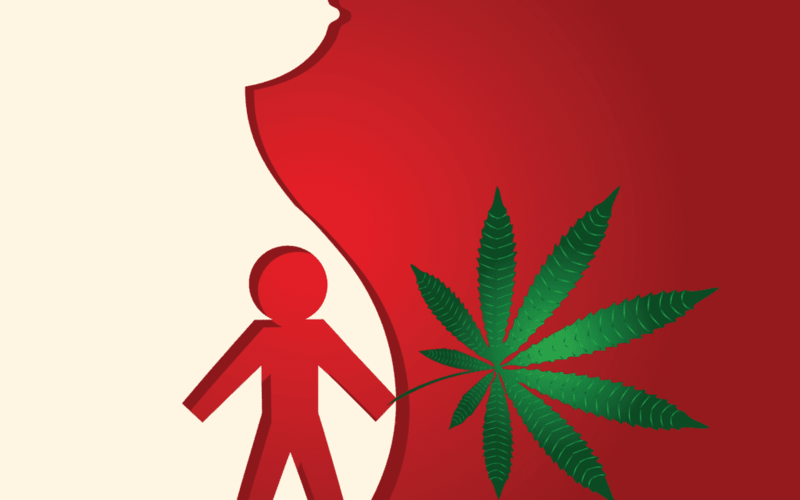 Smoking CBD-rich hemp flower or marijuana during pregnancy is not a recommended method of consumption. Cannabis flower will inevitably contain some level of THC—even the trace amounts found in hemp flower. Plus, smoking, or even vaping, cannabis or concentrates during pregnancy is something many women have an aversion to—not only during pregnancy, but on just about every other day as well. Pregnancy heightens the sense of taste and also results in food and flavor aversion. Some flavors are very unappealing at this time. A better method of utilizing CBD during pregnancy is ingesting CBD oil in either tinctures or infused edibles or beverages. This is a more universally pleasing way to take advantage of CBD, and the dosage is more precise. Consuming edibles infused with THC can cause negative experiences that result from overconsumption and the uncomfortably powerful intoxicating results that can occur. With CBD, however, there is no risk of a psychoactive experience, so as long as dosages are moderate, beneficial CBD effects should result. Women who are pregnant and believe they would receive relief from CBD should make a decision after educating themselves about the possible pros and cons during this critical juncture in their lives. Part of their decision process should include feedback from their prenatal care physician. CBD products can benefit a range of health factors. With pregnancy and parenthood being profoundly life-changing events, the best course of action for pregnant women is to proceed through the nine-month period carefully considering what is best for themselves and their unborn child. Parenthood is a huge responsibility—and also one of the most rewarding experiences a woman and man can experience. Women and their bodies go through so much during this pivotal stage, that all decisions should be made carefully and with both eyes wide open about all potential benefits and consequences. Enjoy your pregnancies, ladies, and the wonderful life you will bring into this world!